I signed up for an account the day Autodesk announced Autodesk PLM 360, their cloud based PLM solution. During the launch webcast Buzz Kross of Autodesk claimed that his PLM solution was “insanely configurable” and that none of his beta customers took more than three days to get up to speed with Autodesk PLM 360. So I decided to try it out for myself. Unlike some other people in the CAD media, I’m not going to pretend that I know anything about PLM. I have never configured a PLM system in my life that was actually used in production and I don’t think I ever will. I’m basically a CAD software guy who has a common sense knowledge of how an engineering business works. Please note that this is not a review of Autodesk PLM 360. I am not qualified to review it. 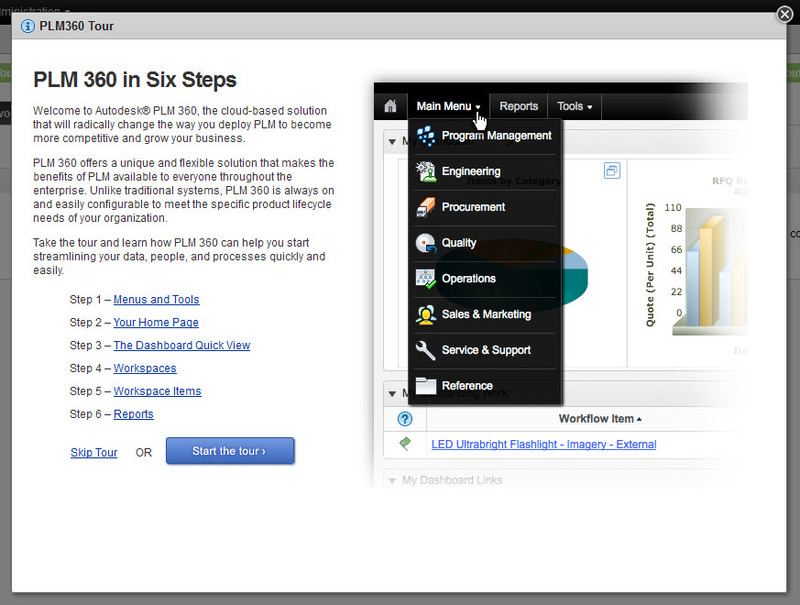 However, Autodesk is marketing PLM 360 as a PLM system for everyone. They are saying that you don’t need to dish out large amounts of money to PLM consultants to set things up for you. So by that logic, someone without any PLM experience, such as myself, should be able to figure this out on his own, right? Let’s see. The first thing I got after signing up for an account was an email containing a link to my PLM 360 instance along with the Administrator user name and password. After I logged in I was asked to accept the Terms of Service. After accepting the Terms of Service I was invited to take the PLM 360 tour which quickly took me through the user interface, dashboard, workspaces and reports. After glancing through the tour it became quite evident to me that the first thing I needed to get a grip of in PLM 360 was Workspaces, something which I will explain in the next part of this series.